That's what I thought. Ok, she fancied him but I don't think it overpowered Doctor Who as Rose did. I mean, c'mon, it's David Tennant with a sonic screwdriver and a time machine.... who wouldn't fancy him? I definitely did. Occasionally Martha's crush on the Doctor was a bit annoying, but at least they didn't obsess over it for the whole series after it like they did after Rose left. I was thinking "For heaven's sake, man, get a grip! You have two hearts, one can afford to get broken every now and then!" My thoughts precisely. River is bloody AMAZING. And the chemistry is definitely building, in my opinion. And agreed with your River comment as well, although I've got to dash so don't have time to do an official quote! It could be that the "damage" has already been done so he wants to go galavanting through time for a while anyway before he has to tell her. Perhaps she is somehow pregnant and not pregnant at the same time, or perhaps she was pregnant and was actually gone for a lot longer than she thought and had the baby already... though you would think she would notice the after-effects of that. On the issue of how the little girl knew about regeneration, I think it is plausible that it's some kind of innate knowledge or genetic memory. There are species on Earth that migrate and remember migration routes that were taken by the previous generation, for example. No one actually knows how this genetic memory thing works, I'm just saying, it exists. Plus regeneration seems weird to us but to the Time Lords it's a natural biological process. Even if she is only a half-Time Lord or pseudo-Time Lord...? I might watch the first two episodes over again to try and get all this straight in my mind because I'm just that cool. Donna Noble was the best, she really felt like an equal to the Doctor especially in terms of wit. I think I just prefer the 'I can give as much as I get' type of attitude from people and woman in general. Especially when the male counterpart is supposed to be so awe inspiring and dominating (intelligence for example) like the Doctor. Rose would have fluttered her eyes to get the Doctor to do anything Making Donna part time lord for her last episode was perfect. Fitting end to a sassy and witty companion. Why does it take the doctor 5 days to rescue Amy? We know she's been in that tardis-esque thing for five days but where has he been? Surely he can't be certain they'd wait until the moon landing to &quot;bring silence&quot;? River also says &quot;Well I say she's human&quot; when inspecting the space suit. Being an archeologist you'd think she'd know. So maybe the kid ain't a time lord? I'm of the opinion that Amy's off hand joke &quot;time head&quot; implies that whilst her sprog won't be a time lady; it may suffer some of the attributes time lords possess. Therefore if the girl is Amy's and she turns out to be River (mighty big assumptions I know, but I like where this is leading), then her changing appearance provides a loop hole for Steven Moffet to keep River in (and thus show her adventures with our doc) and provide an exit for Alex Kingston (who's surely too big an actress to want to play all the adventures her and the doctor must do to have their relationship). Also it would mean our companion for next season will be River, therefore we don't have to start from scratch like the last 3 or 4 companions. Archaeology at times is complete guess work and you try to work out yourself what it might have been used for. Always a guessunless there is proof and then that isn't always available. The TARDIS does something &quot;new&quot; that the Doctor didn't know it could do. A character first seen in the Series 6 opening story returns. We meet a new race of *****. A gag from The Curse of Fatal Death is evoked through The Doctor's friendship with a famous psychoanalyst. The Doctor gets it wrong, more than once. We see Amy and Rory sleep together. The Doctor does something very similar to Amy that he performed in Day of the Moon. Rory does something we've seen him do a number of times but should really only happen once. Not been posted. Oooooh intriguing. The problem with that is the fact that some people actively avoid this thread as occassionally minor spoilers are posted. They want to avoid those. can someone explain to me how to use spoilers please? The first tag should read "spoiler" too. The TARDIS does something "new" that the Doctor didn't know it could do. I totally just thought of something else. Information about the Silents erased itself over time. Like the hologram in the TARDIS - it stopped running and the Doctor couldn't get it back, and none of them could remember what they had seen. So eventually, the moon landing footage wouldn't have the suggestion to kill the Silents in it anymore - surely? In order to survive, all the Silents would have to do would be to hide in their tunnels until the message erased itself. That would explain why there was one in 2011. A character first seen in the Series 6 opening story returns. Canton? We see Amy and Rory sleep together. Interesting. Are we meant to assume that they haven't slept together before this or is this just for the drama? Anyway I'm sure the Daily Mail will have something to say about it. The Doctor does something very similar to Amy that he performed in Day of the Moon. Huh? Rory does something we've seen him do a number of times but should really only happen once. Again what? Looking forward to the ones in bold. 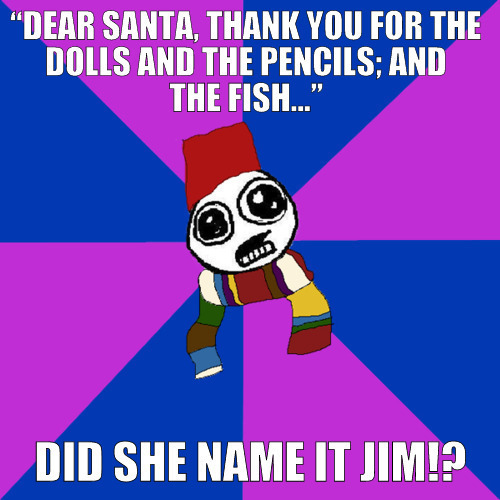 Anyone else really wanting to meet/see jim the fish ? Rory 'dropped out of the sky', could Rory be part Time Lord, as its speculated that Amy may be special, but what about Rory, he states that he can choose what to remember and block out certain things etc. Rory is a nestene duplicate, not a Time Lord. Yup, something so obvious - realised so early. Usually the revelations are stuff that are discrete, you can look back on and say &quot;oh yeah&quot; but they're not 'staring you in the face' obvious, handed on a silver platter.